Woo hoo!!! The hat is done!!!! Thanks to everyone for the supportive comments. This was the first time I've ever encountered a split in my yarn, but I'm getting the idea it's not as uncommon as I thought? Cottage46 Knitter's comment was right, ripping back to the grey was so much easier because the stitches really stood out against the black and green. And while it was a bit frustrating to have it happen so close to the end, it also was good because it didn't leave much to re-do. I can't take credit for the color combo - Sweetpea picked them out himself. Okay, his first idea was blue and orange, but the next day he changed his mind and picked these nice colors. I actually ran short on the black, so we came up with adding the grey and green at the top. It worked out better than I had hoped, and looks like we planned it that way all along. That's one more Christmas present knocked off my list!! I still have too many left to do. I've started adding progress bars for some of them over in my sidebar. I was afraid it would make me feel pressured, but it actually makes me feel more organized. I'm also finding it encourages me to knit more, just so I can update the bar!! It also helps me see that I really am making progress if I hit a part of a project that feels like I'm knitting and knitting and getting no where. In other news, we had our first official snowfall today. I've never been a fan of the white stuff, but I've decided it's not so bad when you don't have to try to travel in it. In fact, I didn't go out in it at all! I had great intentions of taking some outdoor pictures to post (for those of you who live in warmer climates and dream fondly - if not misguidedly - of snow), but I just couldn't convince myself to leave the warm house. Next snowfall, I promise!! Woo Hoo -- you did GREAT!!! the FO is perfect, as is the photo! misguided? i'm hoping snow will keep the crazy holiday drivers at home! you should see the way some people drive in the rain here. it's absurd! i love your hat! it came out really nice!!! The hat turned out beautifully and the picture is great. The progress bars will help with motivation. 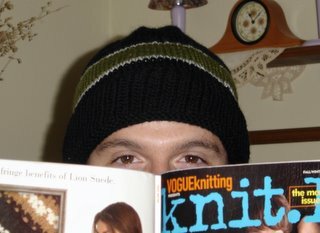 Sometimes I think "I better knit something or I'll have nothing to blog!" I never used to mind snow, but now I have a husband who worries too much and I am the sole decider about when to close the library due to weather. Aaack. Ah, snow. I know thee a bit too well. Great job on the hat, I like the by mistake on purpose green and grey stipes on the top they just add something to it. I always dream of making myself progress bars, but really do I need anything else to take time away from my knitting??? Maybe after Christmas, no wait, there's the baby due in June and now another in August. After that? No, then it'll be time to start Christmas knitting. Ok, how about January, 2007?